The opening line of our last blog published was “There are so many causes for celebration in life.” In that blog Michelle spoke of our extraordinary kids finding joy in the every day and even in the adverse situations they encounter. I am lucky enough to witness this joy daily. Our kiddos sometimes arrive to us tired, frustrated, spent, done! We are intentional about teaching them how to self regulate, to be able to turn it around. This is a process and takes it takes time; but once a child has the tools he or she needs, it is priceless! Then, we celebrate with him! It is hard work for a child to be able to overcome adversity, and it does not go unnoticed at Tiqvah. We take those kiddos on field trips monthly. 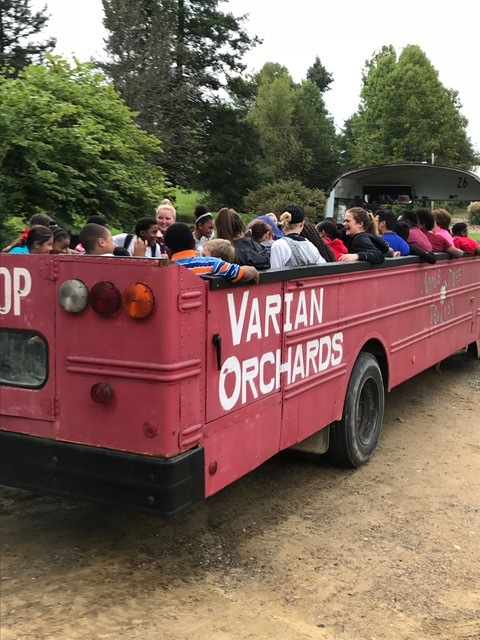 We went to Varian Orchards a few weeks ago and had a blast. With everyone loaded on the party bus and off for an adventure, I stayed behind to tend to some set up. I could hear the screams and laughter ringing through the hills. It was so invasive that I found myself laughing out loud along with them. The smiles on their little faces upon return told a great story. The “rollercoaster” rides after pizza and apples were just as memorable! Last week we were able to celebrate the success of the Green Team (5th grade) with a Harvest Party! At the end of each day the team “grades” their day, if it was a good day they add another link to their class chain. The chain reached the floor which means it was party time! They enjoyed a special dinner and watched a movie! They are now starting a new chain to earn another party! Way to go Green! We are now in the process of collecting report cards and planning our next field trip; this one looks a little different as we will be celebrating good grades! A favorable report card earns a spot! You will have to check our facebook page to see where we go, don’t want to spoil it just yet. 😉 In fact, check back often! Our incredibly dedicated team leaders are often taking kids on mini excursions on the weekends. We have two team leaders and two little boys at a Malone football game right now as I write this blog! They sent me a pic, look at those smiles!